Fairbanks Aurora Tours. Experience the famous Northern Lights also know as the Aurora Borealis in Fairbanks, Alaska. Fully guided, small group tour. Witness the magic of the Northern Lights as they dance across the sky. 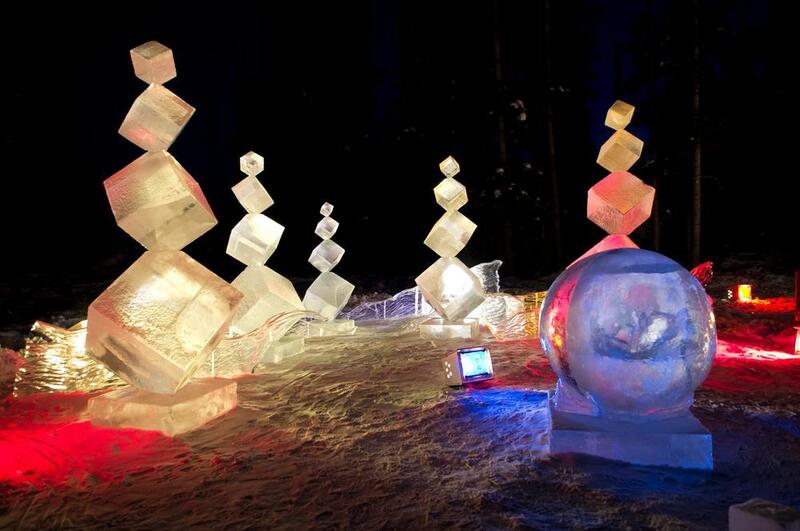 View Ice Sculptures in Fairbanks. 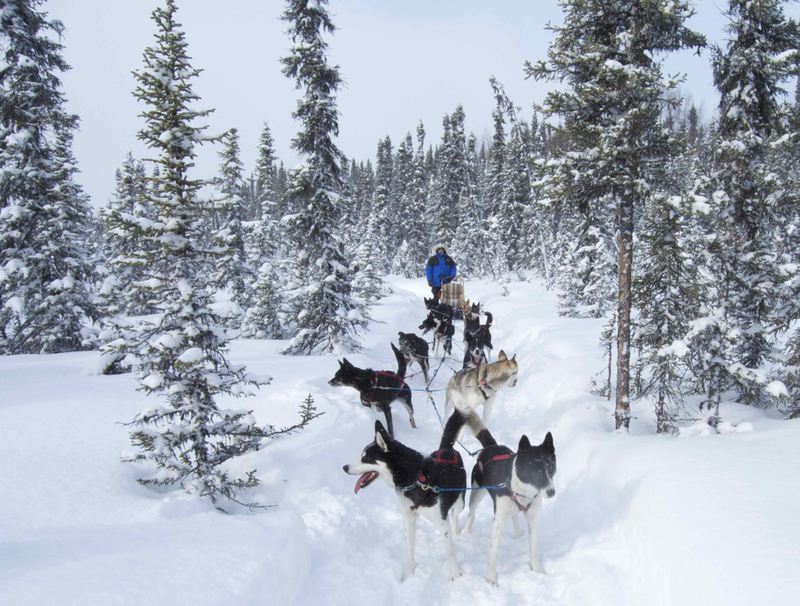 Learn about dog sledding and mush your own team of dogs. Enjoy a dog sled tour through the beautiful Alaskan wilderness. 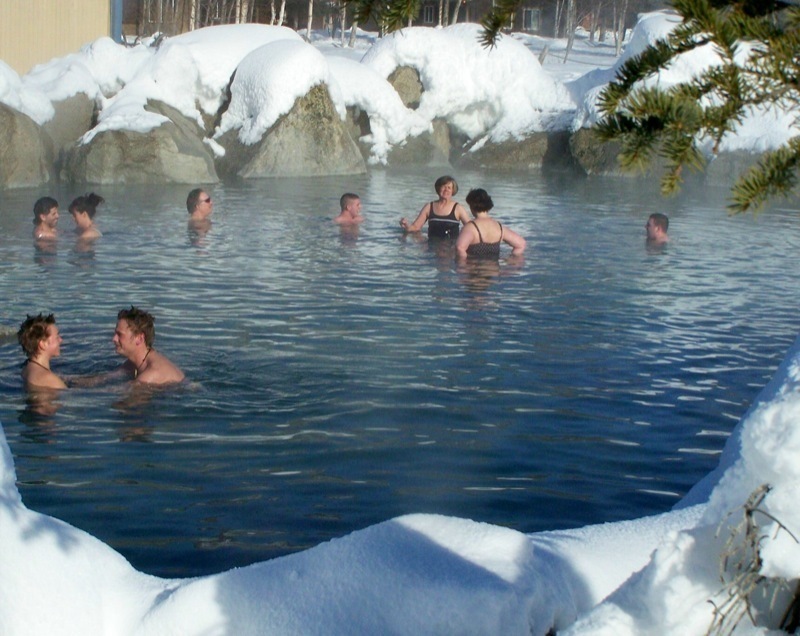 Enjoy the thermal waters of Chena Hot Springs. Visit Fairbanks Alaska, one of the best places on Earth for experiencing the beautiful and mysterious northern lights of Alaska. This location provides a terrific balance of occurrence, frequency and aurora activity. People from all over the world travel far and wide to Alaska to view the stunning and mystical Aurora Borealis and to participate in an exciting winter activities like dog sledding. Our Aurora Borealis / Northern Lights tour packages include all accommodations, activities listed, transportation & professional photographer/guide that will assist you in making sure that you capture the aurora with you camera!. Day 1: SATURDAY: Arrival: Arrive in Fairbanks and transfer to hotel via courtesy shuttle. Fairbanks is largest city in the Interior region of Alaska, located less than 120 miles south of the Arctic Circle. One of the best places on earth for experiencing the beautiful and mysterious aurora. Aurora is visible on average more than 200 days per year in the vicinity of Fairbanks. The rest of the day is free to wander around and explore this pleasant city and its shops. The hotel is located only ten minutes from the downtown shopping area. The hotel also offers a health club, pool and whirlpool for your convenience to help you unwind from your long flight up to Alaska. This evening, weather permitting, we will go outside and search for the aurora at a viewing location outside the city of Fairbanks. We will be outside searching for the lights from about 10pm to about 2 - 3am. Overnight in Fairbanks. ABOUT THIS TOUR: Adventure travel is exactly is as its name implies, an adventure! Although every attempt is made to adhere to these itineraries, participants need to acknowledge and willingly accept the unexpected route and itinerary changes due to factors beyond our control. About Aurora viewing and moon phases: we run our tours even when there is a full moon, a new moon and at all times in between. During a full moon the foreground is brighter, allowing you to capture the foreground. During a new moon, the sky is darker so the lights may appear slightly brighter. However, since we are in a place where the lights are so bright anyway, this makes very little difference in the quality of viewing. Aurora viewing is subject to weather conditions and solar activity and its not guaranteed. 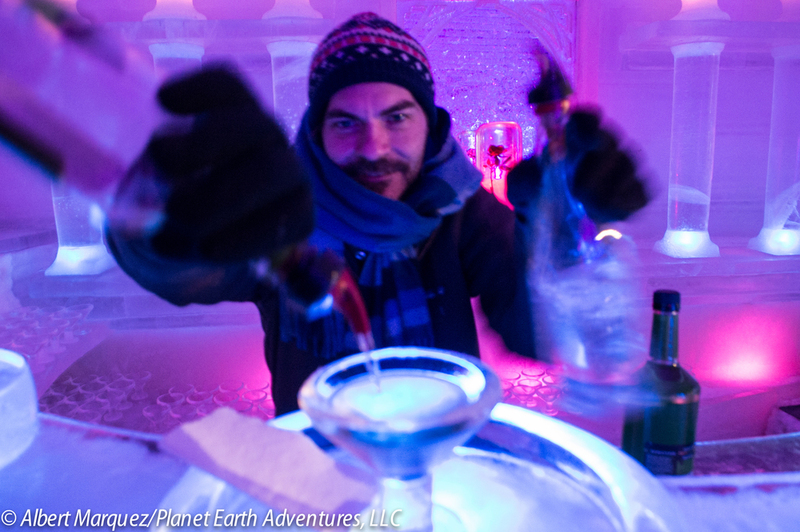 Some activities are subject to change when temperatures are below -30°F. 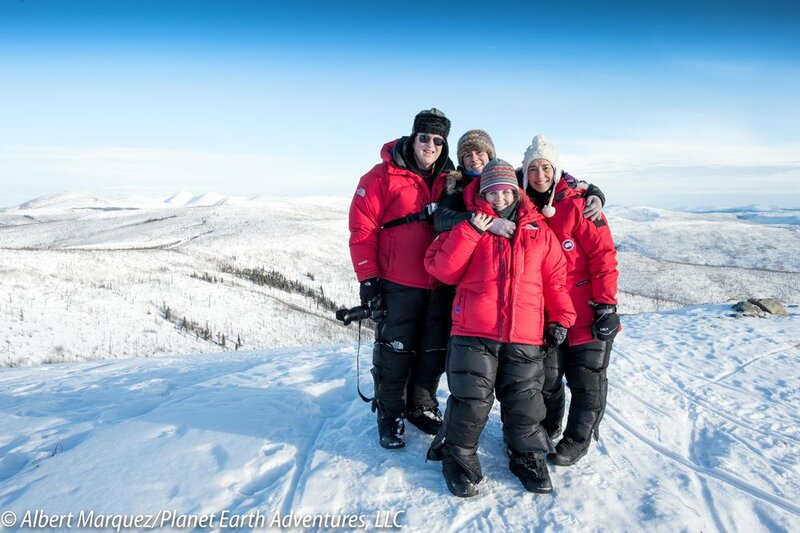 The Northern Lights Adventure Tour does not require a high degree of physical fitness. However, we will be exposed to extremely cold weather, often experiencing temperatures well below freezing, which in itself can be physically challenging. We may also have to walk in deep snow. Most nights we will stay up past midnight to look for the northern lights, which typically appear later in the evening. WHAT IS INCLUDED & WHAT YOU NEED TO KNOW: Transportation, lodging, transfers and baggage handling and meals as indicated on the itinerary. All rates are per person in U.S. dollars based on shared occupancy. Single supplement is $975 for this tour. Tour does not include Alaska taxes, air transportation to and from Anchorage or any optional tours, liquor, items of personal nature or purchases made on-board the vessels. Winter clothing rental is available at Chena Hot Springs Resort. Toasty warm outdoor pants, parka and “bunny” boots are available for a fee while at Chena Hot Springs. Airfare to/from Fairbanks is not included. TRAVEL INSURANCE: We strongly suggest purchasing trip cancellation/interruption insurance to protect your travel investment at the time you sign up for one of our trips. This coverage will offset cancellation charges in the event of illness before or during your trip. Trip cancellation/interruption and baggage insurance is available at a supplemental cost. Click Here to purchase travel protection. WINTER GEAR RENTAL: Anyone visiting Alaska in the winter time should bring a warm hat, gloves, neck scarf, and a heavy coat. Layering is the best way to keep warm in Alaska. A light weight thermal with a fleece and a loose fitting jacket is recommended. Please refer to our "What to Wear Winter Guide" by clicking the link below. If you are traveling through Anchorage, 6th Avenue Outfitters rents insulated snow type pants, parkas with hoods, and boots. We do not guarantee availability or sizing. There are no reservations on garments and it is first come-first serve. We will be happy to pick up your rental gear for you. Please call 6th Avenue Outfitters for availability. TOUR COST: From $2,795 per person/double occupancy.